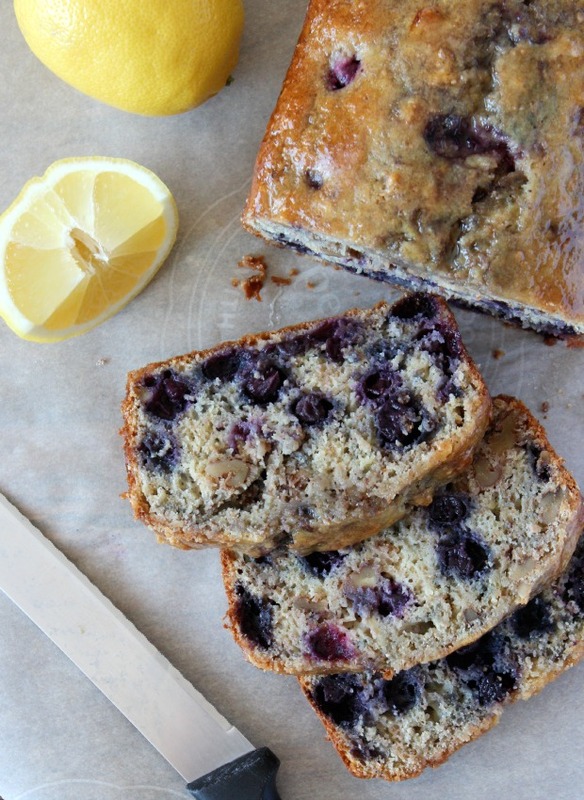 Try this delicious recipe for moist and wholesome blueberry lemon bread with walnuts. Quick, easy and satisfying for the whole family! It was beyond cold and windy yesterday, so I decided to put hardwood and tile shopping for our main floor on hold and do some baking instead. There’s something about the warmth of the oven and smell of baked goods on blustery winter days, isn’t there? I’ll make up any excuse to stay home on days like those! Besides, I had all of the ingredients on hand to make blueberry lemon bread. If you enjoy the tartness of lemon as much as I do, this quick bread is for you. It’s also filled with wholesome blueberries and walnuts to keep you satisfied after just one slice (okay, maybe two)! Trying to cut back on wheat? This recipe replaces part of the all purpose flour with brown rice flour. Just a bit more whole grain to increase your fibre intake. Hey, every little bit counts, right? Enjoy! 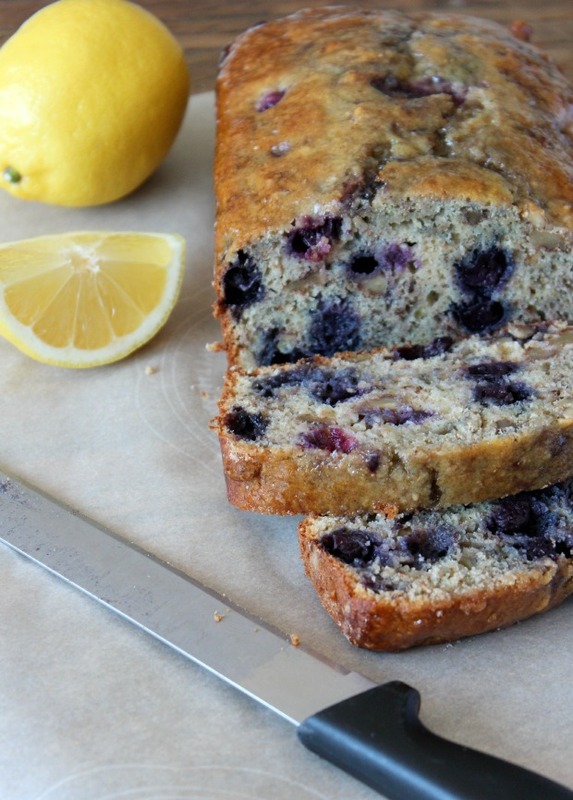 A delicious recipe for moist and wholesome blueberry lemon bread with walnuts. Preheat oven to 350 degrees. Grease and flour a loaf pan (8 x 4"). In a dry skillet, toast walnuts over medium-high heat until golden brown (1-2 minutes). In a mixing bowl, add all dry ingredients and whisk to combine. In a medium bowl, add milk and lemon juice. Add remaining wet ingredients and whisk just to combine. Make a well in the center of the dry ingredients and pour in liquid ingredients. Mix gently just to combine. Carefully fold in walnuts and blueberries (do not over mix). Transfer to prepared pan and bake for 55-60 minutes until skewer inserted in center comes out clean. Cool for a few minutes and then remove from pan and allow to cool on a rack until room temperature. For the glaze, add sugar and lemon juice to a small saucepan and bring to a boil over high heat. Reduce heat and continue stirring until the sugar is dissolved. Brush glaze over the bread while it's still warm. I love blueberries in baked goods, this looks awesome. This looks so nice – perfect for… another… cold day! Looks so yummy. What can you suggest to substitute the coconut oil? You could use butter or olive oil. I wonder can I replace lemon with lime instead. My husband does not like lemons. Will it taste the same? It would definitely taste different, but you could give it a go. I’d probably cut back the amount of lime you use.